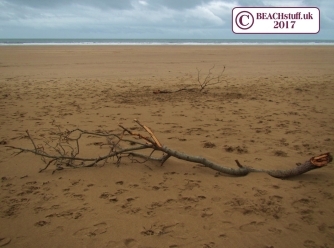 Wood regularly gets washed up onto beaches. 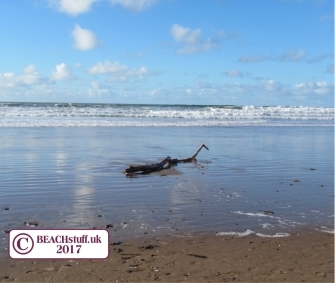 As a general rule, the livelier the waves, the bigger the winds, the larger the pieces of wood that get washed up. Some can be natural - branches that have been broken off and have ended up in our water courses; trees that have been uprooted by high river waters or blown down by gales and so on. But also there are less natural sources - planks, pallets and cut logs can similarly be washed in to our seas. 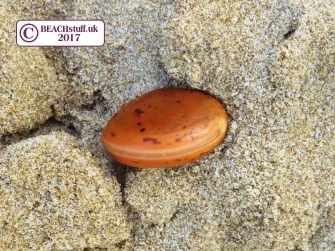 A final source is the remants of structures embedded in the sand which can be revealed at times when the tide and sand level is low. 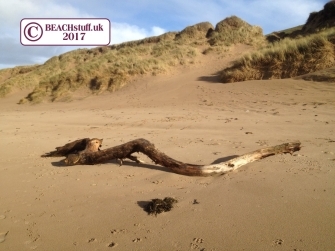 Wood is an important part of beach ecology. It traps sand which reinforces dune strength and can start the development of new dunes. It also is home to insects, and shelters plants and birds. 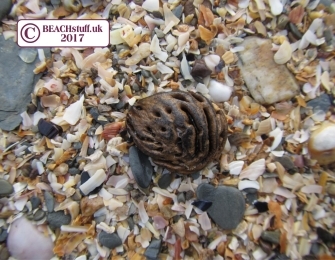 Rotting down, it adds useful nutrients and texture to sand to help plant growth. 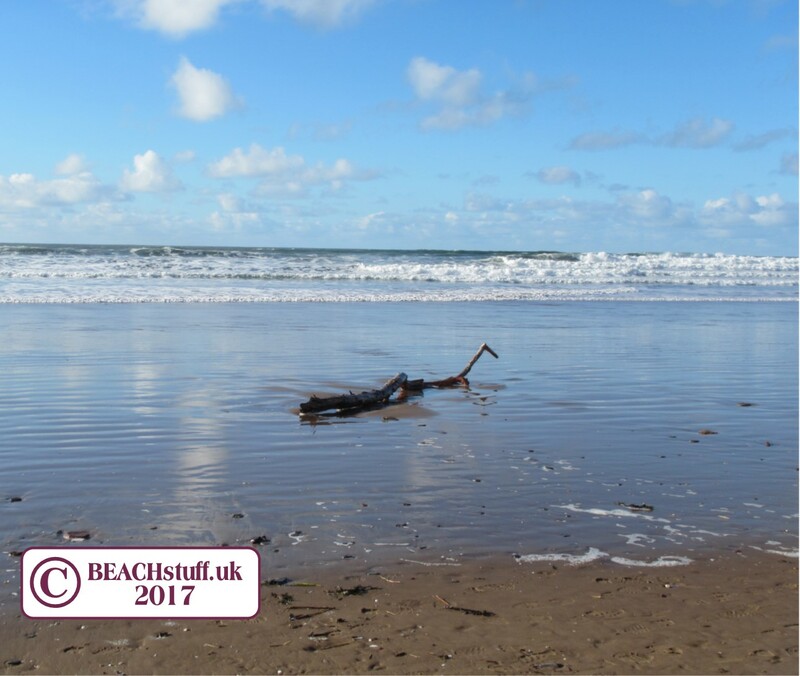 For this reason, it is important that beaches are not stripped of all their wood for burning or craft projects. Driftwood is exactly what it says - it is wood that drifts. After being bleached by the sun, and worn down by the sand, it can be extraordinarily beautiful. 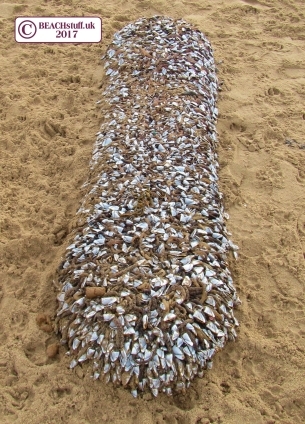 Out at sea, wood provides essential resting places for birds and insects, and may also support goose barnacle colonies (pictured above). Some drfitwood is manmade - like the pallet below left - and some is entirely natural - like the branches below right. 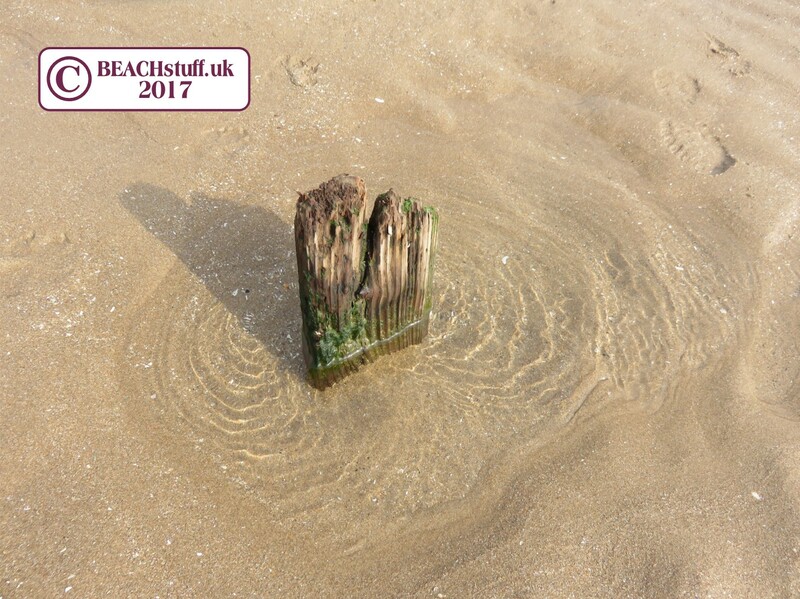 When the tide goes out, and when sand levels are low, posts can sometimes be seen on some beaches. These may be the remains of old piers (walkways to boats anchored in deeper water), or perhaps old groynes (wooden barriers to prevent the sea moving sand down the beach). It is useful to find more than one post to see if they form a recognisable pattern. 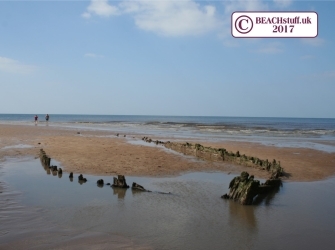 Occasionally, 'posts' will turn out to be the remains of a wooden ship, like this one in North Devon. Wood rots in the water and gets damaged by bring bashed against rocks and so forth. 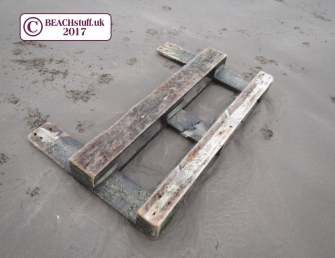 As a result, whole items (except pallets which often seem to make it onto the beach in one piece) are rarely found. I was delighted to find this carpenter's mallet one day. 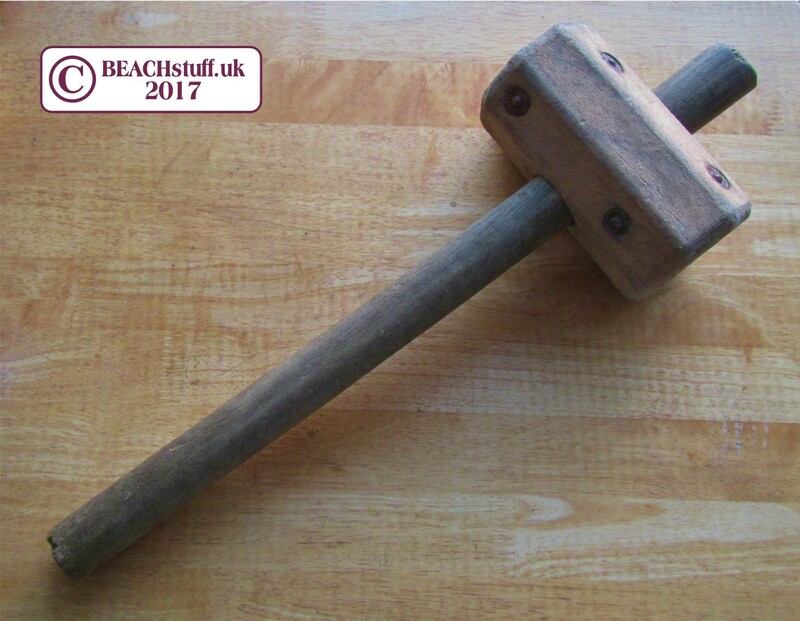 Perhaps someone had taken it onto the beach to hammer in their wind break and it had got lost in the sand? 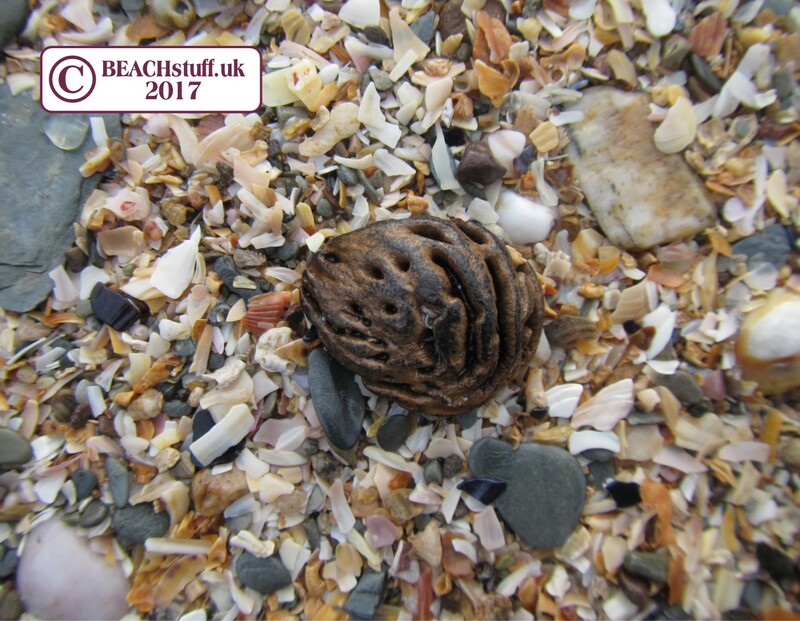 These woody beans or seeds may turn out to be sea beans - more information can be found here. This small round woody shell has come from an almond. More information about the other nuts which can wash up here.